How am I going to get my QTUM now? China has banned ICO's and I trusted Bizhongchou to keep my coins safe until the mainnet is released. Is the QTUM project going to continue? Am I going to receive my investment and when? Am I going to get a refund in Ethereum? I'm sort of in the same boat, the one site was not showing an address to deposit to during the ICO and I bought in through ICO365 which didn't offer the tokens to trade with. I read an article https://www.coindesk.com/chinese-ico-site-suspends-services-amid-reports-regulator-scrutiny/ that gave me a little hope but that was on the 31st so who knows if what they said about honoring previous sales applies. I also understand that isn't the exchange either one of us bought on but I figured that if they are able to do the same we'd be alright. Also I'm curious how much QTUM is held up in those exchanges. Here's hoping and praying that things work out. You have to use google translate. Its not in english. So far I am keeping my qtum on Bizhongchou too. Do you guys think that's safe to do? I can withdraw it out to an eth wallet as tokens but I figure I might as well keep it there for the main net to be released. Generally speaking people say to keep your coins off of exchanges. The only reason I left mine on the exchange is because ico365 did not offer the ability to withdraw tokens. If I were you I would hodl them on a separate wallet. That said they are releasing the main net in a week so you could just wait that out. This doesn't really help anything but I'm pretty optimistic that although we'll have to wait we will eventually get our qtum. From what I've read China bans something and looks into how they want to control it. I'm optimistic because I think there is a sizable about of qtum earmarked for those exchanges. I think the qtum association released that to represent themselves as a legitimate company. @needhelppls Are you sure that you can withdraw your QTUM right now? I contacted [email protected] but they haven't responded after 2 working days. @battlechort I have read on some exchanges that ICO's will have to provide the exchanges with lists of investor accounts and that investors will be forced to send back tokens to the ICO addresses and receive mandatory refunds. QTUM foundation is also offering voluntary refunds at a rate of 3800 QTUM per 1 BTC. This is absolutely outrageous and insulting. It would be far better if they offered for us to return the tokens issued on chinese exchanges and forwarded our tokens to a Western exchange. At least that would be fair!!! After all, QTUM asked westerners and easterners (including chinese) to participate in their global crowdsale. They should compensate every investor that is forced to refund at current market price. That is the ethical thing to do. I also wanted to add that I only got into QTUM at the ICO rate 3600 QTUM per 1 BTC, so how can they ask for 3800? Additionally, I purchased with ETH. Would I also receive the exact amount of ETH I invested if I refunded without selling any of my stash? What if I decided not to refund ever, Will the chinese indefinitely freeze my option to withdraw until I comply? Or will they simply seize my QTUM for themselves? @qtumbob I've been contemplating what you said and other scenarios as far as what the Chinese gov will do what the qtum foundation would do and what the exchange would do and all sorts of permutations of above. Anyhow I was just planning on hodling out for my tokens no matter what because, as you said, there's a massive loss at the refund price. Good news though, I think, here's a snippet of a notice from my exchange (translated from Mandarin). Other items that have been confirmed to be retired and have been cleared in the Verification Program: Lucky, QTUM, RTS, ICOCOIN, INS, BTM, FID, UBC, SWFTC, ELC, WTC, IPC, YOYOW, ugChain, ZGC. Sounds like the project has been accepted by the gov. Not exactly positive as this is just a machine translation. I know I'm on a different exchange but if it was 'verified' I would imagine that would be with the gov so I would assume you would be alright. The Qtum foundation may already know about this which is why they aren't making moves to enact a more equitable refund. They just said had to throw out the offer in order to comply with recommendations that the government made knowing no one would take them up on the offer. Horrible timing with the launch days away I'm sure they are super busy already. Keep faith brother and strong hands. [email protected] emailed me back and informed me that I can in fact withdraw my coins. They even said that I should do so as soon as possible as they are not a licensed wallet. I tested 1 QTUM so far and it showed up on my MEW wallet. I'm in the process of removing the rest as we speak. Good to hear that it gives me hope. Sounds like your out of the woods, grab your ticket to the moon and Hodl. I've got all my coins now! Would you mind sharing how you managed to get your coins out, I can't into the site dashboard. 2. 资产 已经 移交 项目 方, 由 项目 方 完成 后续 清退 工作 的 项目: 投票 链 (ELC), ugChain (UGT), 沃尔顿 (WTC), SWFTcoin (SWFTC), 瑞 资 链 (RTS) wifi (UBC), ZenGold (ZGC). 3. 其他 已 确认 清退 并 在 沟通 清退 处理 方案 的 项目: 路 印 协议 (LRC), 比 原 链 (BTM), 币 飞 (FID), 爱 科 币 (ICO), 印 链 (INS)知 产 链 (IPC), 量子 链 (QTUM), 优 Wifi (UBC), YOYOW (YOYOW), iex.ec (RLC), Matchpool (GUP), MobileGo (MGO), STORJ (STORJ), Tenx (PAY) , Aeternity (AE). 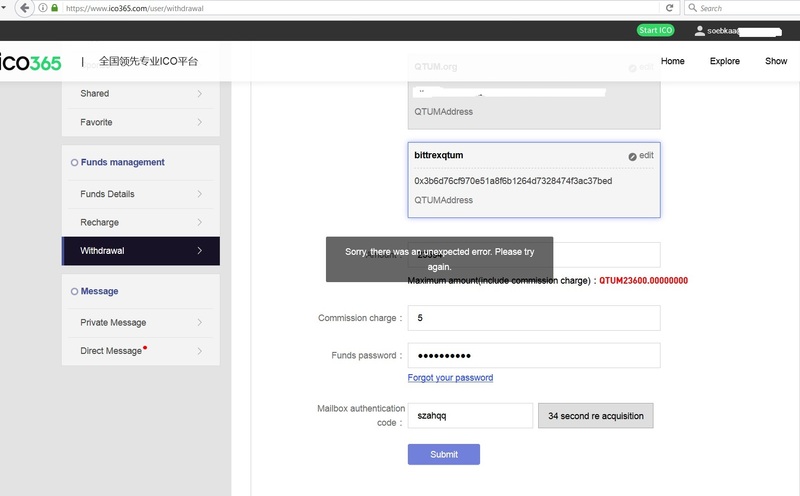 it seems that some ICOs Tokens can be sent correctly? (position 2 of statement ), because QTUM, since it's 6 months ago, no? @bitpaul @BattleChort I am in the same situation as you with 832 Qtum frozen on my ico365 account. Just an fyi in the release on the work they've done for Sept 11th there was a mention that if you bought through ico365 you need to contact them. @battlechort great did you get any answer? @chandav28 No, not yet, I'll be sure to update this thread when I do though. I have more than 50 000 on my ico365.com account, any update here? very worry that they will refund my btc, I need Qtum tokens!